Chile Eboe-Osuji said his primary ambition as president of the International Criminal Court is to get more countries to ratify the agreement that established the court. 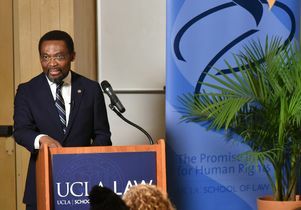 Chile Eboe-Osuji, the president and chief judge of the International Criminal Court, highlighted the United States’ history of leadership in international tribunals and justice during a visit to UCLA School of Law. 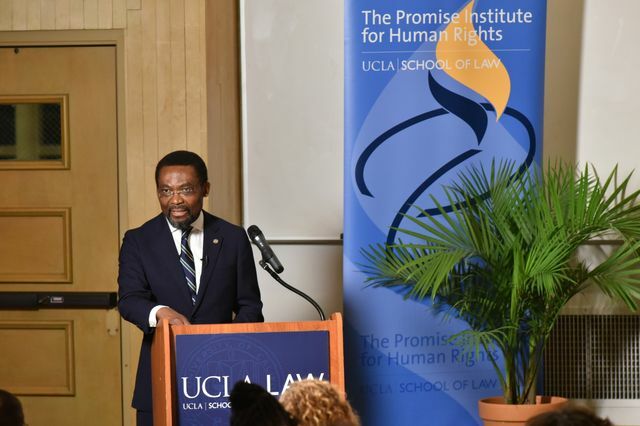 Eboe-Osuji rarely appears at public events but traveled from the ICC chambers in the Hague to Los Angeles at the invitation of UCLA Law’s Promise Institute for Human Rights. His address on Jan. 28, “International Criminal Justice: An American Legacy to Our Shared World,” highlighted U.S. efforts to advance global human rights and justice, including leadership in the Nuremberg trials after World War II and the prominent roles of American lawyers in trials arising from atrocities in Rwanda and the former Yugoslavia. Though American leaders have helped provide the inspiration and framework for the court, the United States is not a party to the ICC. Eboe-Osuji said his primary ambition as ICC president is “more universal ratification of the Rome Statute,” the agreement that established the court in 2002. Eboe-Osuji has been a trial judge on the ICC since 2012 and was named to a three-year term as its president in March 2018. A native of Nigeria, he previously served as legal advisor to the U.N. High Commissioner for Human Rights, senior prosecution appeals counsel in the case against former Liberian president Charles Taylor, and senior legal officer to the judges of the International Criminal Tribunal for Rwanda. During a question-and-answer session led by Promise Institute Executive Director Kate Mackintosh, Eboe-Osuji discussed the court’s jurisdiction and processes, and encouraged UCLA Law students to pursue work in human rights. Chile Eboe-Osuji, president of the International Criminal Court in The Hague.